With the increasing understanding of human biokinetics, health professionals are able to spot flaws in training, environment, and biomechanics quickly and avert significant disability with ITBFS. Biomechanical screenings can be used to identify predisposing factors and correct them before symptoms ever develop. Aggressive intervention, particularly with athletes and industrial workers, can resolve the problem before it becomes disabling. Surgery is rarely indicated. When surgical treatment is called for, the most common procedure for ITBFS is resection of the posterior portion of the ITB and, if desired, the adventitial bursa deep to the band. Surgery is performed with the knee held in 30° of flexion and consists of a limited resection of a small triangular or elliptical piece of the posterior part of the ITB covering the lateral femoral epicondyle. The bursa may be removed in certain cases as well. Arthroscopic techniques are being employed more frequently. For patient education resources, see the Osteoporosis Center, as well as Knee Pain and Knee Injury. The intermuscular septum connects the ITB to the linea aspera femoris until inserting just proximal to the lateral femoral condyle. From there, it passes in its broad expansion between the lateral aspect of patella and the biceps femoris to insert into the Gerdy tubercle, off the lateral tibial plateau. This expanse helps the lateral collateral ligament and posterolateral capsule to stabilize the knee. ITBFS typically is observed in people who exercise vigorously. The overuse creates stress that the body cannot repair, and soft-tissue breakdown occurs. 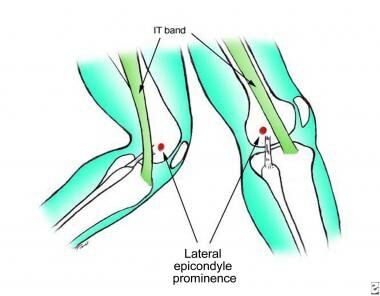 When the knee flexes, the ITB moves posteriorly along the lateral femoral epicondyle. Contact against the condyle is highest between 20° and 30° (average, 21°); thus, when the band is excessively tight or stressed, the ITB rubs more vigorously. A small recess is formed between the lateral femoral epicondyle and the ITB as it travels along the lateral thigh to the tibial plateau. This space was believed to have a separate bursa lying deep to the band, but studies revealed it to be synovium that is a lateral extension and invagination of the actual knee joint capsule (lateral synovial recess [LSR]). The LSR lies underneath the ITB and acts as an interface between the ITB and the lateral femoral epicondyle. Histologic analysis demonstrates inflammation and hyperplasia in the synovium, whereas magnetic resonance imaging (MRI) studies have demonstrated diffuse signal abnormality below the band and in the synovium but not in the ITB. This suggests that this syndrome is not a tendinopathy. Variance is observed in the congenital thickness of the band; patients with thicker bands may be predisposed to ITBFS. In runners, friction occurs near or just after foot strike during the contact phase of the gait cycle. Downhill running reduces the knee flexion angle and can aggravate ITBFS, whereas sprinting and fast running increase the knee flexion angle and are less likely to cause the syndrome. [2, 7, 8, 9, 10] The friction point at the lateral epicondyle prominence is illustrated in the image below. Illustration of the friction point at the lateral epicondyle prominence. Note the shift in position of the iliotibial band from anterior to posterior as the knee moves into flexion, drawing the iliotibial band across the prominence. The etiology of ITBFS is multifactorial. Many causative factors have been postulated, few with overwhelming evidence supporting them. However, most limb-length discrepancies are not actual anatomic variations but physiologic changes related to malalignment of the pelvis. For example, a superior shear of the left or right innominate (ilium) in relation to the sacrum would cause the leg on the ipsilateral side to migrate in the superior direction as well, thus creating a shorter leg in comparison to the right. Attempts to correct this difference with a heel lift would only reinforce the dysfunction in the pelvis. Genu varum is considered a risk factor because of increased tension on the ITB as it is stretched more over the lateral femoral epicondyle. This concept is widely accepted, though with little empiric support. Overpronation is controversial as well. In the running cycle, the lower limb strikes the ground with a rigid supinated foot. As the leg moves forward, the tibia internally rotates over the planted foot, "unlocking" it into a pronated-everted position, which allows for weightbearing. Pronation and internal rotation stress the ITB. Excessive pronation causes quicker tibial internal rotation and increased hip adduction, stressing the ITB over the lateral femoral condyle. Hip abductor weakness is an important factor as well. [13, 14] When the foot strikes the ground, the femur adducts against the eccentric load of the abductors (gluteus medius and TFL). These muscles move from eccentric to concentric through the support phase and into the propulsive phase of gait. 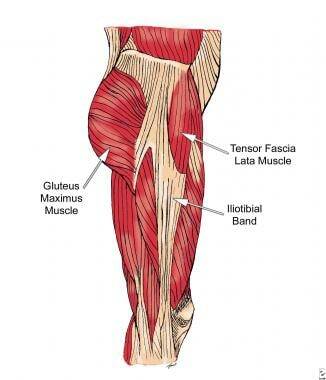 The gluteus medius also externally rotates the hip, while the tensor fasciae latae internally rotates. Myofascial restrictions and inflexibility can increase stress in the posterior ITB, particularly with the TFL. Tightness in the hip flexors (iliopsoas), extensors (gluteal muscles), and rotators (particularly piriformis) can shift more load to the abductors and adductors. Weaker hip abductors eventually fail under continuous stress. The overall incidence of ITBFS in the general population is not well reported. Depending on which population is examined, the incidence is in the range of 1.6-52%. It varies with the target population's type and intensity of activity. For instance, Linenger et al reported that in 12 weeks of Marine basic training, ITBFS was the most common specific injury and accounted for 22.2% of all lower-extremity injuries. Runners experience 12% of all running-related overuse injuries from ITBFS. Most patients with ITBFS recover with conservative therapy and enjoy good prognoses. One study in 1992 documented 19 athletes with ITBFS, all of whom were treated successfully without surgery. Those for whom surgery is eventually performed are patients who are motivated to return to a specific activity in which ITBFS limits or prohibits their participation. Ellis R, Hing W, Reid D. Iliotibial band friction syndrome--a systematic review. Man Ther. 2007 Aug. 12 (3):200-8. [Medline]. Hamill J, Miller R, Noehren B, Davis I. A prospective study of iliotibial band strain in runners. Clin Biomech (Bristol, Avon). 2008 Oct. 23 (8):1018-25. [Medline]. Kirk KL, Kuklo T, Klemme W. Iliotibial band friction syndrome. Orthopedics. 2000 Nov. 23(11):1209-14; discussion 1214-5; quiz 1216-7. [Medline]. Lebsack D, Gieck J, Saliba E. Iliotibial band friction syndrome. J Athl Train. 1990. 356-61. Fairclough J, Hayashi K, Toumi H, Lyons K, Bydder G, Phillips N, et al. The functional anatomy of the iliotibial band during flexion and extension of the knee: implications for understanding iliotibial band syndrome. J Anat. 2006 Mar. 208(3):309-16. [Medline]. Krivickas LS. Anatomical factors associated with overuse sports injuries. Sports Med. 1997 Aug. 24(2):132-46. [Medline]. Biundo JJ Jr, Irwin RW, Umpierre E. Sports and other soft tissue injuries, tendinitis, bursitis, and occupation-related syndromes. Curr Opin Rheumatol. 2001 Mar. 13(2):146-9. [Medline]. Telhan R, Kelly BT, Moley PJ. Hip and pelvis overuse syndromes. Miller MD, Thompson SR, eds. DeLee and Drez's Orthopaedic Sports Medicine: Principles and Practice. 4th ed. Philadelphia: Elsevier Saunders; 2015. Vol 2: 989-95. Noble CA. Iliotibial band friction syndrome in runners. Am J Sports Med. 1980 Jul-Aug. 8(4):232-4. [Medline]. Orchard JW, Fricker PA, Abud AT, Mason BR. Biomechanics of iliotibial band friction syndrome in runners. Am J Sports Med. 1996 May-Jun. 24(3):375-9. [Medline]. Strauss EJ, Kim S, Calcei JG, Park D. Iliotibial band syndrome: evaluation and management. J Am Acad Orthop Surg. 2011 Dec. 19(12):728-36. [Medline]. Baker RL, Souza RB, Fredericson M. Iliotibial band syndrome: soft tissue and biomechanical factors in evaluation and treatment. PM R. 2011 Jun. 3(6):550-61. [Medline]. Fredericson M, Cookingham CL, Chaudhari AM, Dowdell BC, Oestreicher N, Sahrmann SA. Hip abductor weakness in distance runners with iliotibial band syndrome. Clin J Sport Med. 2000 Jul. 10 (3):169-75. [Medline]. Mucha MD, Caldwell W, Schlueter EL, Walters C, Hassen A. Hip abductor strength and lower extremity running related injury in distance runners: A systematic review. J Sci Med Sport. 2017 Apr. 20 (4):349-355. [Medline]. Fredericson M, Guillet M, Debenedictis L. Innovative solutions for iliotibial band syndrome. Phys Sportsmed. 2000 Feb. 28 (2):53-68. [Medline]. Ho GW, Howard TM. Greater trochanteric pain syndrome: more than bursitis and iliotibial tract friction. Curr Sports Med Rep. 2012 Sep-Oct. 11 (5):232-8. [Medline]. Taketomi S, Inui H, Hirota J, Nakamura K, Sanada T, Masuda H, et al. Iliotibial band irritation caused by the EndoButton after anatomic double-bundle anterior cruciate ligament reconstruction: report of two cases. Knee. 2013 Aug. 20 (4):291-4. [Medline]. Linenger JM, Christensen CP. Is Ilotibial Band Syndrome Often Overlooked?. Phys Sportsmed. 1992 Feb. 20 (2):98-108. [Medline]. Nemeth WC, Sanders BL. The lateral synovial recess of the knee: anatomy and role in chronic Iliotibial band friction syndrome. Arthroscopy. 1996 Oct. 12(5):574-80. [Medline]. Firer P. Results of surgical management for iliotibial band friction syndrome. Clin J Sport Med. 1992. 2:247-50. Ekman EF, Pope T, Martin DF, Curl WW. Magnetic resonance imaging of iliotibial band syndrome. Am J Sports Med. 1994 Nov-Dec. 22(6):851-4. [Medline]. Muhle C, Ahn JM, Yeh L, et al. Iliotibial band friction syndrome: MR imaging findings in 16 patients and MR arthrographic study of six cadaveric knees. Radiology. 1999 Jul. 212(1):103-10. [Medline]. Murphy BJ, Hechtman KS, Uribe JW, et al. Iliotibial band friction syndrome: MR imaging findings. Radiology. 1992 Nov. 185(2):569-71. [Medline]. Drogset JO, Rossvoll I, Grontvedt T. Surgical treatment of iliotibial band friction syndrome. A retrospective study of 45 patients. Scand J Med Sci Sports. 1999 Oct. 9(5):296-8. [Medline]. Sangkaew C. Surgical treatment of iliotibial band friction syndrome with the mesh technique. Arch Orthop Trauma Surg. 2007 May. 127(4):303-6. [Medline]. Barber FA, Boothby MH, Troop RL. Z-plasty lengthening for iliotibial band friction syndrome. J Knee Surg. 2007 Oct. 20(4):281-4. [Medline]. Cowden CH 3rd, Barber FA. Arthroscopic treatment of iliotibial band syndrome. Arthrosc Tech. 2013 Dec. 19;3(1):57-60. [Medline]. [Full Text]. Michels F, Jambou S, Allard M, Bousquet V, Colombet P, de Lavigne C. An arthroscopic technique to treat the iliotibial band syndrome. Knee Surg Sports Traumatol Arthrosc. 2009 Mar. 17 (3):233-6. [Medline]. Pierce TP, Mease SJ, Issa K, Festa A, McInerney VK, Scillia AJ. Iliotibial Band Lengthening: An Arthroscopic Surgical Technique. Arthrosc Tech. 2017 Jun. 6 (3):e785-e789. [Medline]. [Full Text]. Weiner DS, Tank JC, Jonah D, Morscher MA, Krahe A, Kopits S, et al. An operative approach to address severe genu valgum deformity in the Ellis-van Creveld syndrome. J Child Orthop. 2014 Feb. 8 (1):61-9. [Medline]. Inoue H, Hara K, Arai Y, Nakagawa S, Kan H, Hino M, et al. Outcome of Low-Invasive Local Split-Thickness Lengthening for Iliotibial Band Friction Syndrome. Int J Sports Med. 2018 Feb. 39 (3):232-236. [Medline]. Martens M, Libbrecht P, Burssens A. Surgical treatment of the iliotibial band friction syndrome. Am J Sports Med. 1989 Sep-Oct. 17(5):651-4. [Medline]. Holmes JC, Pruitt AL, Whalen NJ. Iliotibial band syndrome in cyclists. Am J Sports Med. 1993 May-Jun. 21(3):419-24. [Medline]. Iliotibial band noted prominently along the lateral thigh. Iliotibial band at the lateral femoral epicondyle, with the posterior fibers denoted. The Thomas test can be used to evaluate restriction in the iliotibial band, hip flexors, and rectus femoris. Resection of lateral synovial fold through arthroscopic knee procedure. Courtesy of Elsevier, Inc (Cowden CH 3rd, Barber FA. Arthroscopic treatment of iliotibial band syndrome. Arthrosc Tech. Feb 2014;3(1):e57-60).